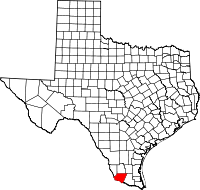 Starr County comprises the Rio Grande City, TX Micropolitan Statistical Area, which is also included in the McAllen-Edinburg, TX Combined Statistical Area, which itself is part of the larger Rio Grande Valley region. It is northeast from the Mexican border. From 2000 to 2010 the population of Starr County increased from 53,597 to 60,968. According to the U.S. Census Bureau, the county has a total area of 1,229 square miles (3,180 km2), of which 1,223 square miles (3,170 km2) is land and 5.9 square miles (15 km2) (0.5%) is water. As of the 2010 United States Census, there were 60,968 people residing in the county. 0.4% were Non-Hispanic White, 0.2% Asian, 0.1% Native American, 0.1% Black or African American, 3.0% of some other race and 0.5% of two or more races. 95.7% were Hispanic or Latino (of any race). According to the Census Bureau, Starr County had the highest percentage of Hispanic residents of any county in the United States. As of the census of 2000, there were 53,597 people, 14,410 households, and 12,666 families residing in the county. The population density was 44 people per square mile (17/km²). There were 17,589 housing units at an average density of 14 per square mile (6/km²). The racial makeup of the county was 87.92% White, 0.15% Black or African American, 0.25% Native American, 0.28% Asian, 0.04% Pacific Islander, 9.91% from other races, and 1.46% from two or more races. There were 14,410 households out of which 54.70% had children under the age of 18 living with them, 66.50% were married couples living together, 17.40% had a female householder with no husband present, and 12.10% were non-families. 11.30% of all households were made up of individuals and 5.90% had someone living alone who was 65 years of age or older. The average household size was 3.69 and the average family size was 4.01. In the county, the population was spread out with 37.40% under the age of 18, 11.00% from 18 to 24, 27.10% from 25 to 44, 16.30% from 45 to 64, and 8.20% who were 65 years of age or older. The median age was 26 years. For every 100 females there were 94.20 males. For every 100 females age 18 and over, there were 88.10 males. The median income for a household in the county was $16,504, and the median income for a family was $17,556. Males had a median income of $17,398 versus $13,533 for females. The per capita income for the county was $7,069, which is the third-lowest in the United States. About 47.40% of families and 50.90% of the population were below the poverty line, including 59.40% of those under age 18 and 43.30% of those age 65 or over. As of 2009 the median household income was $22,418. On May 1, 2009, the former sheriff of Starr County, Reymundo Guerra, a Democrat, pleaded guilty in federal court to a narcotics conspiracy charge. In April 2016, Starr County Justice of the Peace Salvador Zarate, Jr., faced up to twenty years imprisonment and a $10,000 fine on two counts of bribery for accepting a $500 bribe in exchange for reducing bond on two persons arrested on narcotics charges in an incident on Christmas Eve 2014. He was found not guilty of possession of a controlled substance. Zarate is expected to appeal any sentence rendered. 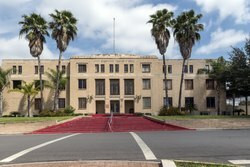 Starr County has long been a strongly Democratic county but suffers from low voter turnout with only approximately twenty percent of its 53,000 residents voting. No Republican has won the county for President since incumbent Benjamin Harrison in 1892 – as of 2017 Starr has the longest streak of voting for Democrats in the entire country. In 1988 the county gave Michael Dukakis his highest percentage in the nation. Starr County is one of only 17 counties in Texas that gave the majority of their votes to Senator John Kerry of Massachusetts, who received 7,199 votes (74 percent) while George W. Bush received 2,552 votes (26 percent). In 2008, Illinois Senator Barack H. Obama did still better than Kerry in Starr County, receiving 8,233 votes (84 percent). Arizona Republican Senator John McCain received 1,488 votes (15 percent). Residents of eastern Starr County are zoned to schools in the Rio Grande City Consolidated Independent School District. Immaculate Conception School, located in Rio Grande City and founded in 1884, is the only Catholic school in Starr County and provides a faith-based pre-K through eighth-grade education to approximately 250 students each year. South Texas College Founded in 1993, South Texas College is accredited by the Commission on Colleges of the Southern Association of Colleges and Schools to award baccalaureate and associate degrees. More than 29,000 students attend STC and a faculty and staff of more than 1,600 serve STC’s five campuses, including a full-service campus located in Rio Grande City in Starr County. The county holds one seat on the college's seven member Board of Directors. The seat is currently filled by Rose Benavidez. The college offers more than 100 degree and certificate program options, including associate degrees in a variety of art, science, technology, allied health and advanced manufacturing fields of study. The college also offers eight online associate degrees options. STC offers a Bachelor of Applied Technology (BAT) degree in Technology Management, as well as a Bachelor of Applied Technology in Computer and Information Technologies. The college is one of only three Texas community colleges accredited to offer a BAT degree and the only community college in Texas accredited to offer two bachelor's degrees. STC has instituted a variety of dual enrollment programs, including early college high schools, drop-out recovery programs and other unique initiatives with high schools throughout Hidalgo and Starr counties. The programs allow eligible students to take college courses while attending high school. Combined, more than 8,000 students are currently enrolled in these programs. The college has also developed two intensive academic programs for students interested in pursuing degrees in the medical and engineering fields. The Dual Enrollment Medical Science Academy and the Dual Enrollment Engineering Academy consist of concentrated two-year programs of study and internship opportunities for qualified students to pursue an Associate of Science degree during their junior and senior years in high school. The program provides opportunities for lifelong learners who want to upgrade their skills, change careers, renew licenses and certifications, or seek personal enrichment. As of 2011 Starr County has about 55 colonias. By 2011 many families were moving to the colonias. Between the 2000 and 2010 census Starr County went through many changes. Four CDPs were deleted, one gained area, twelve lost area and ninety-two new CDPs were created. Only eleven remained unchanged. ^ a b "State & County QuickFacts". United States Census Bureau. Archived from the original on July 20, 2011. Retrieved December 24, 2013. ^ "Texas: Individual County Chronologies". Texas Atlas of Historical County Boundaries. The Newberry Library. 2008. Archived from the original on May 13, 2015. Retrieved May 26, 2015. ^ a b c Grinberg, Emmanuella. "Impoverished border town grows from shacks into community Archived 2012-11-10 at the Wayback Machine." CNN. July 8, 2011. Retrieved on July 9, 2011. ^ "2010 Census Gazetteer Files". United States Census Bureau. August 22, 2012. Archived from the original on April 19, 2015. Retrieved May 10, 2015. ^ "U.S. Decennial Census". United States Census Bureau. Archived from the original on May 12, 2015. Retrieved May 10, 2015. ^ "Texas Almanac: Population History of Counties from 1850–2010" (PDF). Texas Almanac. Archived (PDF) from the original on February 26, 2015. Retrieved May 10, 2015. ^ Miller, Tom. On the Border: Portraits of America’s Southwestern Frontier, pp. 27-34. ^ "通博娱乐 官网". www.poligazette.com. Archived from the original on 2009-05-26. ^ "Presidential election of 1892 - Map by counties". geoelections.free.fr. Archived from the original on 2006-03-07. ^ "David Leip's Presidential Atlas (1988 election statistics)". uselectionatlas.org. Archived from the original on 2008-11-26. ^ "Population and Housing Unit Counts, 2010 Census of Population and Housing" (PDF). Texas: 2010. Archived (PDF) from the original on 2017-02-13.